Out of 105 representatives in the state legislature, the 34-year-old Democrat is one of 27 black representatives — and his election to the post reflects the state's changing political landscape. Recent political scandals such as the resignation of former governor Robert Bentley and former chief justice Roy Moore's suspension from the state Supreme Court, have sent both Republicans and Democrats in search of something new, David Wasserman, political analyst for the Cook Political Report, said. However, Wasserman cautioned, Daniels has his work cut out for him as the young leader of Alabama's minority party. "Twenty years ago it was three parties in Alabama, today it has collapsed into segregated partisan politics," Wasserman said. Born in Barlow, Florida, Daniels was raised in Midway, Alabama by his grandparents with a strong foundation of faith, Daniels told NBC News. Pursuing his passion for education, he attended Alabama A&M University, graduating with a bachelor’s degree in elementary education and a master’s degree in special education. At 23, he became the first black man elected chairman of the National Education Association Student Program, an extension of the National Education Association that provides support to college students seeking a career in public education. As leader of the student program, Daniels worked out of the NEA headquarters in the nation’s capital, meeting with congressional leaders and organizations to find a solution to make college more affordable. He also worked with the Bush administration, where he was instrumental in the passing of the College Cost and Reduction Act of 2007. 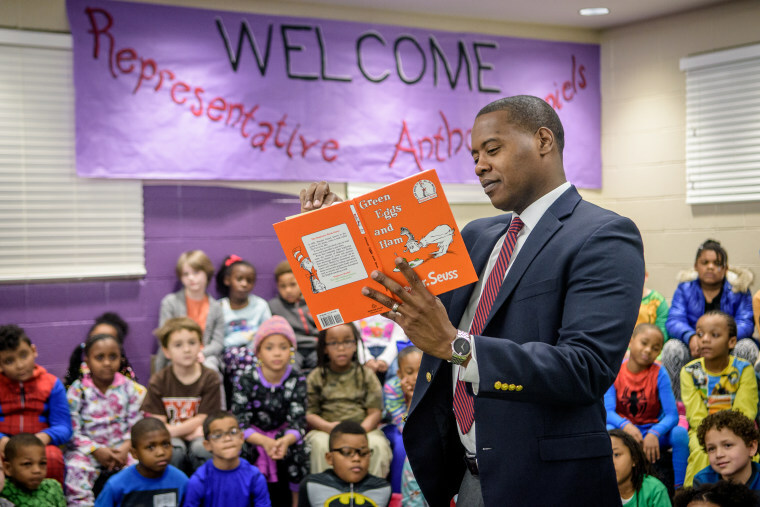 Once he became an elementary school teacher in Huntsville, Alabama, he realized he could have a deeper influence working in government. In 2008, he ran for Alabama State Senate, losing to his then-opponent, Alabama State Representative Laura Hall, a Democrat. He now calls Hall one of his mentors. “It was an opportunity we both had to be on the opposite side of each other, but respect each other,” Hall said. Hall told NBC News that although Daniels is one of the youngest members of the legislature, his youth isn’t the only thing that sets him apart from previous House Minority Leaders. “He came with a plan. He didn’t just talk about running. He had a plan in what he saw and thought about how things should be done. Not saying that anyone else didn’t have a plan, but not to the point that it was articulated in such a way that I believe he can make a difference,” Hall said. Daniels was appointed chairman of the legislative committee for the Huntsville Education Association in 2009 and was elected to the State Board of Directors for the Alabama Education Association in 2010. He helped raise funds for his alma mater working as corporate and foundations relations officer until he was elected to the state House of Representatives in 2014. He has been on a mission ever since to bring jobs to the state and increase revenue, Daniels said. He also says he wants to recharge his party. Having one of the highest positions in the state legislature is a double-edged sword for Daniels. He is grateful, yet fearful. It is a road Daniels wasn’t expecting to travel so quickly. Alabama State Representative Mike Ball, a Republican, says he and Daniels hit it off immediately and thinks highly of him. But Daniels says he is not sure if he'll stay in politics long-term, citing his commitment to kids' education. With the foundation Stay Inbounds he started back in his home town, he says he hopes to provide positive role models to at-risk youth and expose them to opportunities he didn’t have growing up.